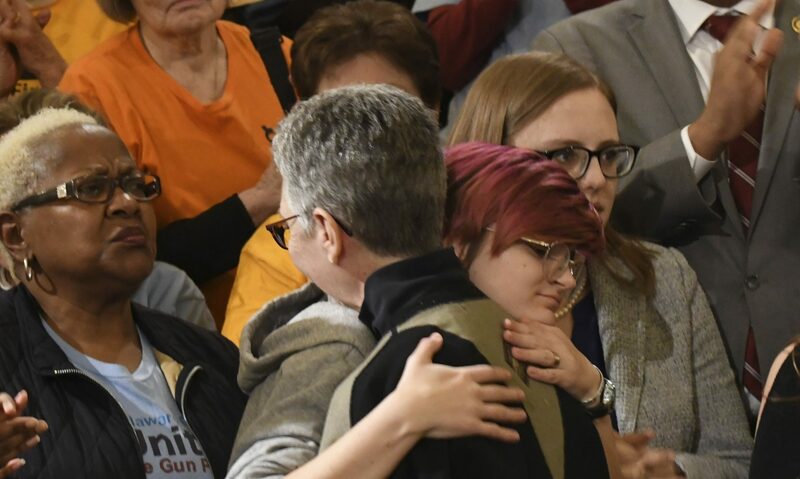 Jo Schlesinger, whose ex-husband was badly wounded in the Oct. 27 mass shooting in Pittsburgh's Tree of Life synagogue that killed 11 people, gets a hug from Cody Murphy after she spoke at a rally in the Pennsylvania Capitol's rotunda calling for lawmakers to take action on anti-gun violence legislation on Tuesday, Jan. 29, 2019 in Harrisburg, Pa. Murphy lives across the street from the synagogue. (Harrisburg) — As a new state legislative session dawns, gun control advocates are renewing their call for change. This is the first time lawmakers have been in regular session since a shooting claimed 11 lives at Pittsburgh’s Tree of Life synagogue. “If we continue to allow so many citizens to live in fear of mass shootings when we can act right now to reduce their risk, we’re robbing them of their right–their fundamental American right–to life, liberty, and the pursuit of happiness,” he said. 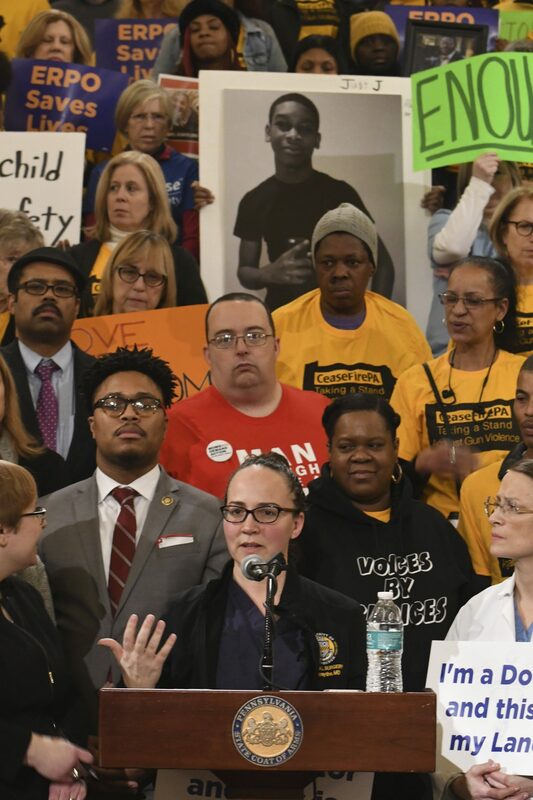 Dr. Raquel Forsythe, a trauma surgeon from Pittsburgh who helped treat victims of the Oct. 27 mass shooting that killed 11 people in the Tree of Life synagogue, speaks at a rally in the Pennsylvania Capitol’s rotunda calling for lawmakers to take action on anti-gun violence legislation on Tuesday, Jan. 29, 2019 in Harrisburg. But gun control remains fraught in Pennsylvania, where a Republican controlled House and Senate–and some Democrats–are generally sensitive to any measure they see as infringing on Second Amendment rights. Last session the legislature passed its first gun law in years, billing it as a way to keep domestic abuse victims safer–not as a gun restriction. “We’re starting to see this as a public health issue, which it really is,” he said. CeaseFirePA Director Shira Goodman agreed that Stephens’ bill is probably the best bet to pass in the short term.